WASHINGTON (Feb. 01, 2011) -- Three coins commemorating the Army are now available for purchase from the U.S. Mint. At a ceremony at the Pentagon Jan. 31, the designs for the three coins were unveiled. The coins feature artwork that commemorates the Army at war, the Army during peacetime, and the modern Army of today. A portion of the proceeds from the sale of the coins goes toward construction of the National Museum of the United States Army. During a ceremony Jan. 31, at the Pentagon, retired Brig. Gen. Creighton W. Abrams Jr. said the sale of three new coins from the U.S. Mint, which feature Army-themed scenes, will help with construction of the National Museum of the United States Army. "What I love about these coins being launched today is that they celebrate Army history with their images and honor the 30 million American men and women who have worn the uniform since 1775," said retired Brig. Gen. Creighton W. Abrams Jr., the executive director of the Army Historical Foundation. Abrams said the coins are important for two reasons. The first, he said, is that sale of the coins will help the AHF build the Army museum at Fort Belvoir, Va., just outside Washington, D.C. The museum, he said would become a "national landmark." "It will engage, educate, inspire and honor Soldiers, veterans, families and visitors of all ages," Abrams said. It is expected the museum will open in 2015, in conjunction with the Army's 240th birthday. 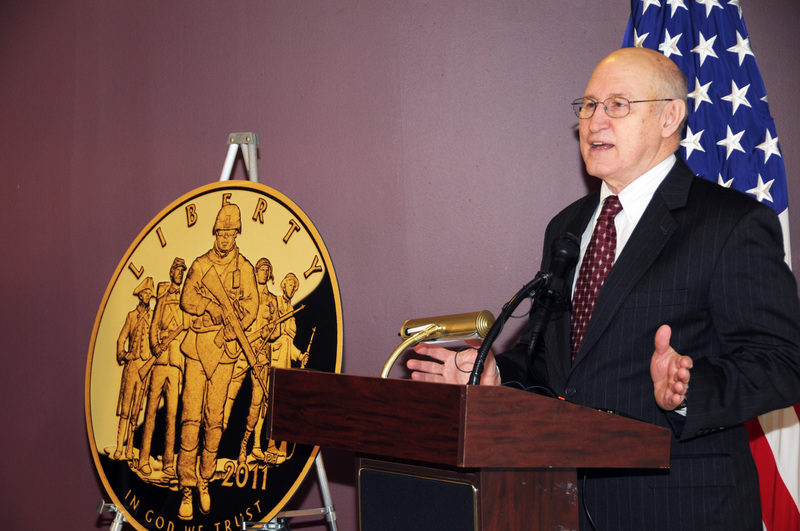 The retired general also said the symbolism of the coins is also significant. "These are great designs," he said. "These are the first-ever Army commemorative coins, and I think they are great mementos if you have got a relative who served in the Army or if you served yourself." The three pieces include a $5 dollar gold coin, a silver dollar and a clad half-dollar. The gold coin features five Soldiers, from the colonial times through the modern era. The silver coin features both a male and female bust, in front of a globe, meant to symbolize today's worldwide deployments. Finally, the clad coin represents the peacetime contributions of the active Army, the Army National Guard and the Army Reserve Soldier. "Their symbolic value is certain to resonate with our more than one million serving Soldiers and their families, and our 11 million surviving Army veterans across the country as sincere public appreciation for their selfless service and personal sacrifices," said Abrams. The three coins are now available for purchase on the U.S. Mint's website -- and range in price from just under $20 for the clad coin to $450 for the gold coin. The coins were designed by artists at the U.S. Mint, and will be struck at the mints in Denver, San Francisco, Philadelphia and West Point, N.Y.
"The men and women of the United States Mint are proud to produce these coins, not only to celebrate the Army's exemplary history, but also to honor the dedication, courage and sacrifices of all American Soldiers, many of who are deployed throughout the world today," said Daniel P. Shaver, of the U.S. Mint. The number of coins to be produced by the mint is limited by the public law that allowed them to be created in the first place. The mint will produce 100,000 gold coins, 500,000 silver coins, and 750,000 half-dollar coins. Those interested in purchasing coins can visit the U.S. mint website at www.usmint.gov/catalog.